My husband and I both love Mexican food and a visit to a Mexican restaurant almost every other week is surely not uncommon for us. We enjoy Cheese and Onion enchiladas, covered with the red enchilada sauce or the spicy green tomatillo sauce. I wanted to recreate the same at home what we often eat out. Hence the Mexican feast at home. I skipped refried beans and the Mexican rice but instead made a Black Bean and Corn Salsa to go alongside the enchiladas. I recently bought a book “Red Hot – A Cook’s Encyclopedia of Fire and Spice” featuring recipes with the use of the various kinds of chillies. There was a recipe for Guajillo Chilli Sauce which can be served over Enchiladas, this is what I tried. 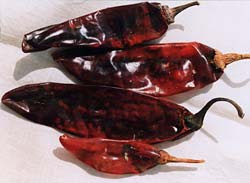 Guajillo chillies are long with a rough skin. The mature fresh pods are a deep reddish brown and have a smooth texture. They have a mild, slightly bitter taste. Preheat the oven to 400 F. Quarter the tomatoes and place them with the peppers and whole garlic in a roasting pan and roast for 45-60 minutes till the tomatoes and peppers are slightly charred. Put the peppers in a strong plastic bag and tie the top to keep the steam in. This helps loosen the skin. Keep aside for 20 minutes. Meanwhile soak the Guajillo chillies in boiling water for 20 minutes. Remove the skin from the tomatoes and peel the garlic. Remove the peppers from the bag and rub the skins off. Drain the soaked chillies, remove the stems and the seeds. Place the peppers, tomatoes, garlic, tomato paste, oregano, brown sugar ,drained chillies and vegetable stock in a food processor and make a smooth paste. Season with salt. Pour mixture into a saucepan and bring to a boil on medium heat, then lower heat and let simmer for 10-15 minutes till sauce thickens. Cool and store in the refrigerator or use as required. Take the flour tortillas and lightly toast each one on a hot pan, till piping hot. Take one tortilla, place 3 tbsp of chopped onions on one end and place grated cheese over the onions. Tightly roll and place the enchilada open side down in a greased baking dish. Repeat with all the tortillas. Pour Red Enchilada Sauce over all the tortillas, cover completely. Spread remaining grated cheese on top. Bake for 15 minutes. Garnish with chopped corriander and serve hot with Black Bean and Corn Salsa. You can substitute the cheese with veggies of your choice, cube the veggies, sauté till half done and roll in tortillas. Bake for 25 minutes to let veggies cook through completely. Combine all ingredients in a bowl. Let stand at least 15 minutes for corn to fully defrost and flavours to combine, then toss and serve. The corn will place a quick chill on this as it defrosts so no need to refrigerate. Serve along with hot Enchiladas. Ooooh, these look SO MUCH better than the ones in a restaurent!!!! Yum! Namratha, WE love mexican food too, Love the sauce.....thanks for the recipe. wow Namratha, the enchiladas look so yummy. And you make it sound so easy. I will be trying these soon. no way!! i made these last weekend adn have been thinking of posting them too!! ur photos are so lovely and the step by step method awesome too...girl u are making me go green ;)...just kiddin!! Mexican food is so close to ours in some aspects that even my parents liked it. I usually make my enchiladas with some roasted vegetables and tofu/paneer... i have one that i'm yet to post as well. Yours looks so good and i love that salsa. thank you, both for the chilli sauce recipe, an the book reco. i don't know how these chilies landed in my pantry, but i have them. Namratha! you beta me to this...partly because my husband has promised to make these for nme and I'm just waiting on him to deliver:) the enchiladas look lovely!!! now you are making me hhungry girl! Thanks Siri dear, I feel like eating them all over again..hehe! Thanks Madhu, give this a try, I promise you won't regret it. Do try them Saju, they are a breeze to make! Oh you have one too ASha, will check it out, haven't seen it yet...and so true about the similarities..atleast in taste. Hehe, that's nice Mansi, hope you get to eat them soon...they are delicious! I love enchiladas! :) Only I donot use so much sauce while baking! :)Nice recipe! Nam, I am going to make this Enchiladas today night. Can I substitute Guajillo chilies with any other kind of chili? If so, what kind? I am not sure where can I find Guajillo chilies here. Hi Sonu, I wouldn't suggest using any other chili in place of a Guajillo because the taste is very different. Guajillos have a smoky taste.Do you have any Mexican stores or International Food stores? You could look there for Guajillo chillies. Will post in my blog someday.